What are business capabilities? What will they do for your organization? How to make a personalized map for your organization? You'll find out in this post. 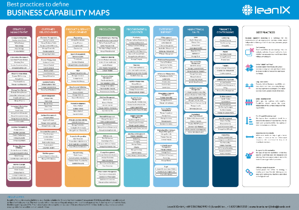 WHAT IS business capability mapPING? In short, business capabilities encapsulate what a business is doing right now and what needs be done in order to meet current and future challenges. LeanIX helps you to create the perfect business capability map for your organization. Use our dependable technique to represent your organization’s business anchor model independent of the structure, processes, people or domains. These best practices will help you map out your capabilities whether you are from the banking or insurance industry, automotive or logistics or any other industry. During a merger, capability maps can help define activities that need to be fulfilled independently of processes and organizations. Capability maps assign applications to user groups and business capabilities even if the organizational structures and procedures of the two companies are very different from each other, which is very beneficial in organizing M&As. This overarching view of applications and their contributing business value makes it possible to assess redundancies and gaps in IT support in both dimensions - functional and usage. What systems of record does each company have? Where is the master data stored for each company? What are the locations of each supporting data center? Use LeanIX workflows, such as the Survey Add-on, to gather all of this information and save it in the LeanIX repository. 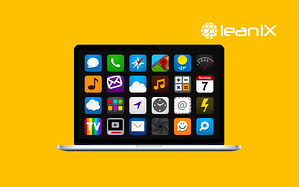 LeanIX’ software serves as a strong, referenceable, accessible single repository of truth. Enterprise Architects help to plan the optimum target landscape. 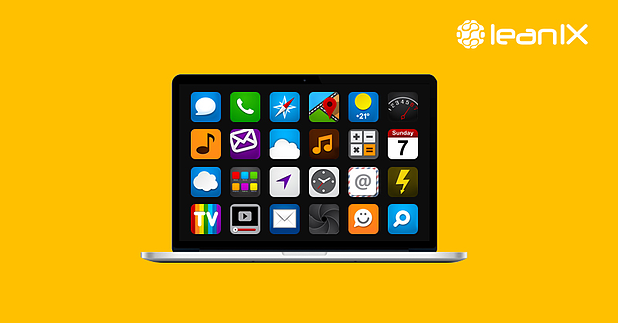 Should one IT landscape be absorbed? 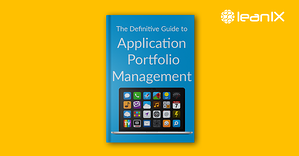 Should we cherry-pick the top-performing applications of both companies’ IT landscapes? 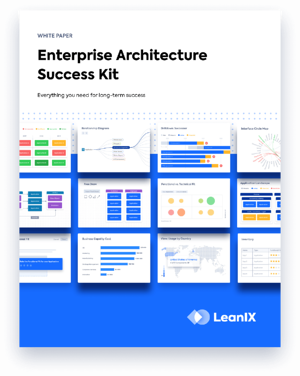 To support this decision, Enterprise Architects may use LeanIX’ software to run an elaborate analysis of the functional and technical fit of each application and to propose a solution from concrete data. LeanIX customer Helvetia, was able to reduce redundancies and realize substantial savings in the merger with Nationale Swiss. In its half-year report, Helvetia reported IT as a major contributor to these savings. The establishment of transparency was a crucial first step toward doing so. Today, the established LeanIX inventory serves as the single source of truth that strategic IT management decisions are based upon. The report on the next page shows an exemplary overview of a target portfolio. Gartner reports that 20.4 billion connected “Things” will be in use by 2020. While the world finds space in their personal lives and homes for smart accessories, Enterprise Architects should look into how the Internet of Things (IoT) can benefit their organizations. IoT brings shorter times to market, provides real-time Big Data insights, enables new services and business models, and reduces cost. In this digital age, progressive companies are looking for ways to manage risk, not to avoid it altogether. 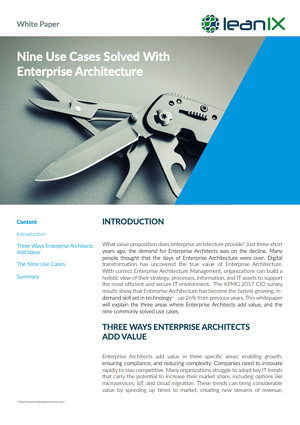 Enterprise Architecture can directly contribute to a beneficial IoT roadmap by managing the risks through defining relevant business capabilities; defining the scope of retirements and new applications; ensuring the proper interoperability of applications; driving and tracking transformation progress in projects, eliminating security risks; and establishing relevant data for future business decisions. Identify the IT components to be replaced in order to mitigate security risks. Want to know more? 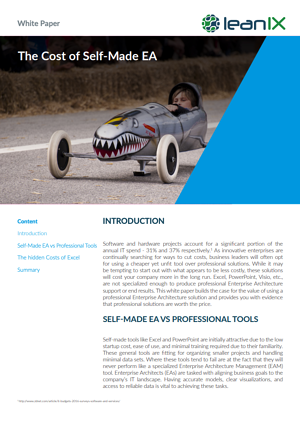 Download our business capability white paper below.